Beuschel is a traditional meal that is increasingly difficult to find on the menus of Vienna. 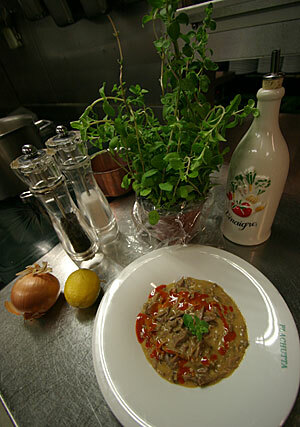 It is made of veal, or rather calf′s lung and heart. Both organs are boiled for hours with vegetables, then chilled, and cut into tiny pieces. The latter measure helps a great deal in making the whole thing look a lot less disgusting. Then the Beuschel stripes are boiled in a creamy sauce and eventually served with a classic Austrian bread dumpling. It is a rather heavy meal and more popular in winter. I took the picture in 2007 at the "Mount Olympus" of Austrian cuisine, the kitchen of the traditional restaurant Plachutta in Vienna′s first district. I did a story on the Beschel for the Spiegel publishing group and used the opportunity to make a little photo essay on the legendary Plachutta. I have put up a Beuschel recipe at the "Austrian Cuisine" section of TourMyCountry.com; if you get the ingredients right, it is not difficult to make. However, it is a lot of work, since both lung and heart can be rich in vessels that need to be removed manually and the whole boiling takes a long time. This is also the reason why many restaurants don′t offer Beuschel on the regular menu. In this day and age, heart and lung of calves usually go to dog′s or cat food and only the red meat makes it to the human top of the food chain.